"Please don't write him off." - Haile Gebrselassie's manager Jos Hermens, who flew to Japan to announce Gebrselassie would not be running this weekend's Tokyo Marathon because he fell last week in training and injured his knee. At what age did you stop feeling young? Haile G out of Tokyo!! Sally Kipyego Is Applying For US Citizenship But Really Pumped To Be Training In Oregon To Represent Kenya At 2011 Worlds And 2012 Olympics In our minds, she should have to make up her mind. Jr. Women's XC Runner Janet Kisia In Kenya Is Latest Star To Be Coached By Famed Colm O'Connell The weird thing is this article says she's 19. If she's 19, how is she in the junior ranks? A Brief Chat With 3:57 Miler Erik van Ingen LetsRun.com headquarters are less than a mile where van Ingen often trains in the winter, so we have always been big fans of his. Now knowing he was inspired by Chris Lear's Sub-4, we are even bigger fans. Youth Speed Skating Coach Still Thrives After Corporal Punishment Allegations Surface An Olympic Gold Medallist from South Korea allegedly used hockey sticks, skate-blade guards, hammers, hand timers and other implements to strike skaters on the buttocks, stomach and hands. Nick Willis To Compete In Charity Race To Benefit Quake Victims Nick Willis was scheduled to receive his Olympic silver medal from Beijing before the meet (explanation here), but now will receive it at a track meet fundraiser in Wellington which he has planned to raise money for the people of Christchurch. Stockholm: World Junior Records Galore Abubaker Kaki (2:17) went out too fast in his world record attempt (25.5) but still won in the 1k (2:17.55) as Meseret Defar (8:36.91) triumphed in the 3,000m, as American Shalane Flanagan 8:39.18 (#3 time for an American) came up short in her AR attempt. In the 1500, Abeba Arigawi crushed the reigning world indoor champ with a 4:01.47 and moved up to #10 all-time and announce herself as a potential future star as Morgan Uceny ran 4:05.35 (#4 all time US). The junior records all belonged to Angelica Bengtsson in the pole vault (4.63). Stockholm Preview: Kaki Racing Augustine Choge And Deresse Mekonnen In World Record Attempt At 1,000m, Meseret Defar Going For 3k WR Should be a good one. Isaiah Kiplagat Koech Aiming For Gold ... And He Says He Prefers "Koech" And FYI, he says he prefers to be called "Koech" over Kiplagat. Linet Masai Looking For Some Redemption After Finishing 2nd In Last Two World XC Races She says the weakness she has tried to correct is her kick. She said: "I’m still disappointed about what happened in Amman and Poland. On both occasions, I was sure I was winning only to lose in the last few metres." Athletics Kenya General Secretary Says It Is Not Possible For Geoffrey Mutai To Train On His Own For World XC Mutai is the hottest runner on the planet, with 3 dominating XC wins in Kenya, plus 2 marathons last year averaging 2:05:03. Mutai has said he will only run World XC if he can continue to train in his camp where he is self coached (yesterday, we said Renato Canova was Mutai's coach, but Canova corrects us here). Alberto Salazar: "I have told Alan (Webb), 'You're no different than any of my other runners.' We don't worry about losing some races. The goal is to compete well and win the big races." Big East: Connecticut Men, Louisville Women Are Big East Champs *Notre Dame Men Finish 2nd This meet was ridiculously close on both sides, with the men's meet being decided by 4 points and the women's by 1.5! On the women's side, Louisville was down going into the last event, the 4 x 4, but took 3rd while the UConn women only managed 6th, giving Lousiville the win. For the men, UConn Coach Greg Roy said the "meet was a war." Frank Shorter Says Doping Is A Problem Among "Weekend Warriors" As Well As The Pros Who wouldn't risk their health for a chance to win the 30-35 age group at their local 5k? Cyclists Are Tough Too Cyclist crashes with splinter through leg and still finishes race in 3rd. Check out the picture. S. African Athletics Boss Leonard Chuene Had Affair With His Staffer, She Licked His Fingers In Public In Front Of Employees, And He Sexted Her With Explicit Texts We're not sure how we missed this, as this news is old and shows you how messed up S. African athletics was, as it didn't get him fired. Isaiah just turned 17 at the end of December and he put on a performance to remember as he pulled away from World Champ Eliud Kipchoge for the super-impressive win. 12:53 indoors is amazing. With no advance fanfare (the track writers in Oregon didn't even write about it), American Galen Rupp was in the race in his 2011 indoor opener and ran a solid 13:21 after being on 13:05 pace at 3k, according to this thread. In other action, Nixon Chepseba got the narrow win over Augustin Choge in a world-leading 3:34 in the 1,500m, and Liu Xiang was 3rd in his European return. *Full John Hancock Release Reigning champs Robert Kiprono Cheruiyot & Teyba Erkesso will defend their titles. Coming March 20th: NYC Half Marathon - Meb, Hall and Abdi! LRC MB: Haile G out of Tokyo!! 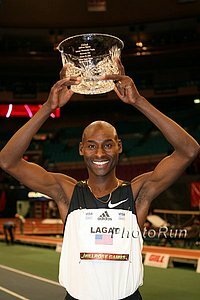 It's Official: Rupp Vs. Lagat At 3k To Be One Of The Highlights Of US Indoors This Weekend We commend the current and former indoor 5k record holders for showing up while many in-shape pros are skipping the meet but think Galen is going to have a real tough time matching Lagat over the last 200m. 2012 UK Trials Almost Certainly Won't Be Held In Olympic Stadium Apparently, organizers think it's more important to focus on preparing for the opening ceremony. Historic Bay To Breakers Race Will Be Celebrating Its 100th Anniversary - Yet Some Thing Race Will Be Cancelled After This Year Supposedly the race is losing money. But doesn't everything California cost more than it brings in? Olympic Bronze Medalist Shalane Flanagan Entering New Partnership With Management Agency This is good news for Kimbia and Shalane. The stars of the sport need to do a better job of connecting with their fans. Shalane went after the American record yesterday and virtually no one knew about it in advance. Alberto Salazar And The "Oregon Project" The 'old' name has been brought back and refers to the group of six athletes Salazar coaches: Adam Goucher, Kara Goucher, Dathan Ritzenhein, Galen Rupp, Alan Webb and Amy Yoder Begley (Mo Farah doesn't count). *She also wants to do the 400/1,500 double this Friday. 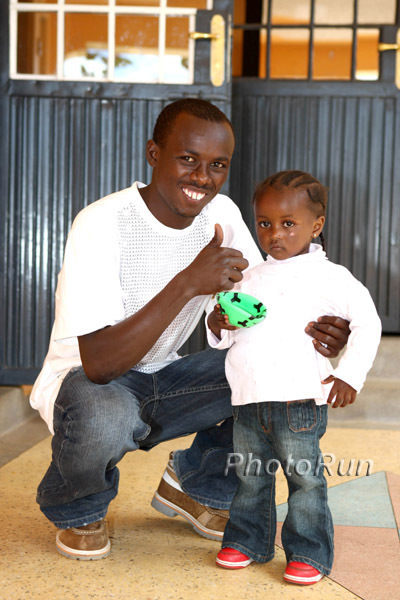 After Two Silvers At World XC, Linet Masai Wants Gold This Year Four seconds separate her from 2 World XC titles. Ethiopian XC Champs: Meselech Melkamu Wins 3rd Title, Hunegnaw Mesfin Triumphs Over Imane Merga, 7:27 Guy Yenew Alamirew We don't think Alamirew made the team. It's Official: Edison Pena To Run Tokyo Marathon Tokyo cements its status as a World Marathon Major with the addition of the Chilean miner. Resse Hoffa Wins Shot Put With 21.08m; Nick Symmonds 4th In The 1,500 Some people on the boards have asked: Where the hell is Nick Symmonds? Well, apparently he is training and racing in Australia. UK Team Dealing With Bout Of Injuries Leading Up To Euros 60m runners Mark Lewis-Francis and Harry Aikines-Aryeetey were hit by groin and hamstring injuries, distance runner Steph Twell broke her ankle in a Belgian XC race, multis star Jessica Ennis pulled out of the Avia meet with an inflamed ankle, and pole vaulter Steve Lewis had his pole snap and he broke his thumb (ironically, this was days after he had requested new poles from his coach). Uninvited Janet Rono Surprises To Win Hong Kong Marathon Rono wasn't invited as a pro athlete, so she paid $1,000 for a plane ticket, entered as a general member of the public, slept on a friend's hotel room floor, and woke up the next day to win the race in a record time of 2:33:42, earning $34,000 in the process. Maybe Meb should pull a stunt like this in Boston? Jason Lehmkuhle Wins Ome 30 km Road Race First American win since 1983. Shalane Flanagan Is Really, Really Thrilled To Have Lisa Koll As Her Training Partner And Vice Versa (link fixed) Flanagan: "The guys have always been very inclusive, but there are certain things the guys don't want to do or talk about. Understandably. They don't want to talk about Oprah. And they don't want to go get pedicures."